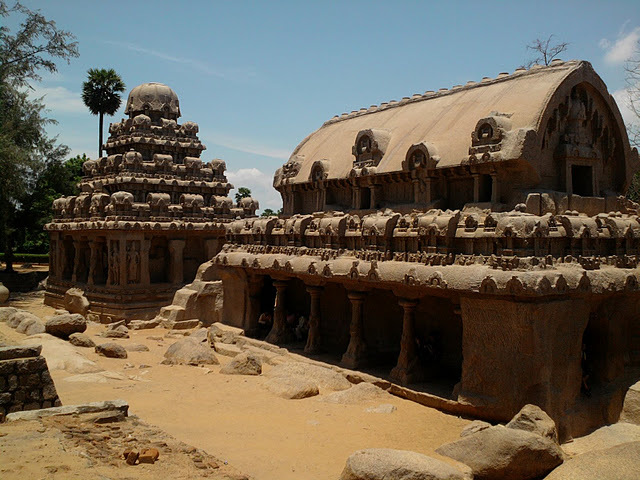 Mahabalipuram also known as 'Mamallapuram', located at a distance of 50km from Chennai on East Coast Road is one of the best weekend destination and also a must visit place in Tamilnadu. Listed as one of the World Heritage Sites by UNESCO, Temples & monuments in Mahabalipuram were built in 7th century and considered as one of the earliest structural temples in South India. The main attractions in Mahabalipuram are The Shore Temple, Five Rathas, Arjuna's Penance, krishna Mandapam, Varaha caves and beach. The name Mamallapuram is believed to have been given after the Pallava king Narasimhavarman I, who took on the epithet Maha-malla (great wrestler), as the favourite sport of the Pallavas was wrestling. 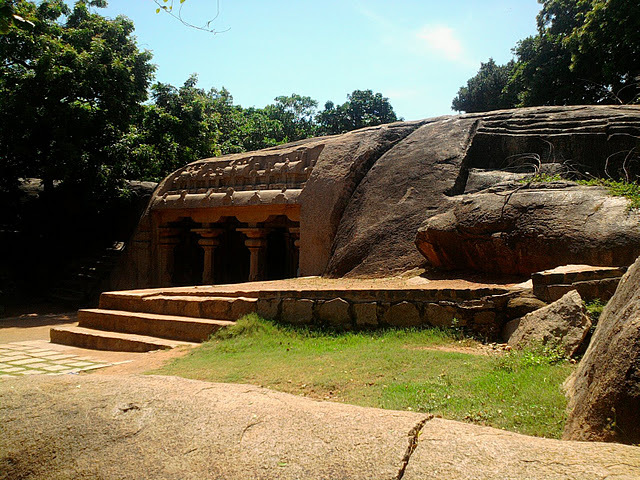 It is also known by several other names such as Mamallapattana and Mamallapuram. 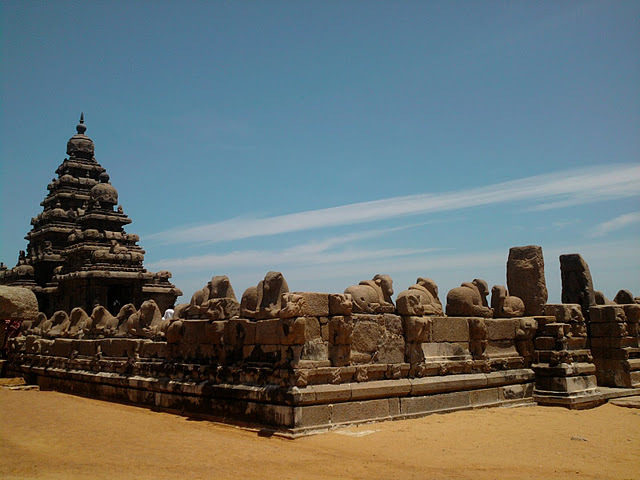 Another name by which Mahabalipuram has been known to mariners, at least since Marco Polo’s time is "Seven Pagodas" alluding to the Seven Pagodas of Mahabalipuram that stood on the shore, of which one, the Shore Temple, survives. 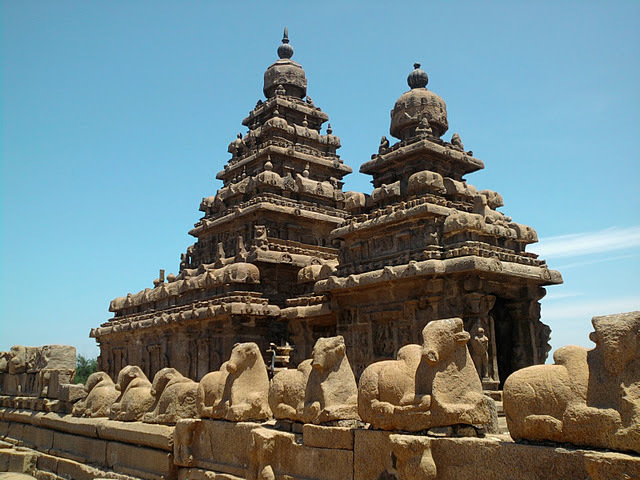 Mahabalipuram temples whose architecture was inspired by the Pallava Art were built during the period 830 - 1100 AD. Shore Temple comprises of three shrines, where the prominent ones are dedicated to Lord Vishnu and Lord Shiva. In the sanctum sanctorium, an image of Shivalinga embraces the site. At the rear end, one can find two shrines facing each other. Here, one shrine is dedicated to Ksatriyasimnesvara and other to Lord Vishnu. The exterior wall of the shrine to Lord Vishnu and the internal side of the boundary wall are elaborately carved and sculptured. Shore Temple is no more a living temple. The structure of the temple makes one to contemplate and perhaps, it was erected basically as a work of art. In southern India, this is one amongst the earliest and most important structural temples. In the recent years, a stone wall has been constructed to protect the shrine from further sea-erosion. The Five Rathas, also known as Panch Rathas, is a set of rock temples. The rathas are associated with the great epic Mahabharata. These monuments are carved out a single rock with choice of all known forms of plan and elevations. The first ratha that is located right by the entrance gate is Draupadi's Ratha. It is shaped like a hut and is dedicated to the goddess Durga. Next comes Arjuna's Rath. This one has a small portico and carved pillar stones and is dedicated to Lord Shiva. There are no carvings inside this temple, but many are on the outside. Directly in front of Arjuna's Rath is the Nakula – Sahadev Rath. 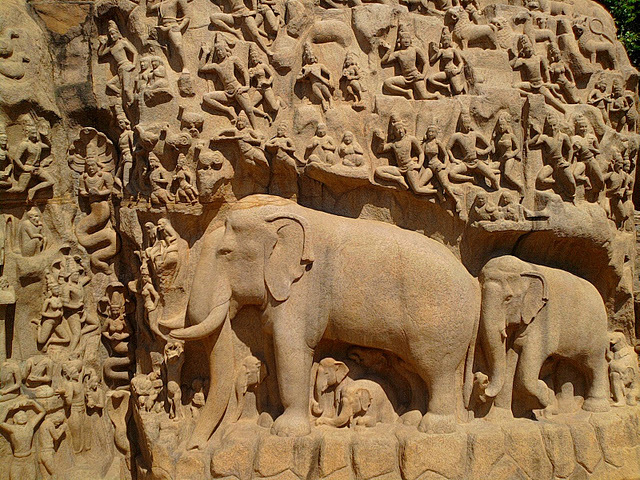 This ratha has some huge elephant sculptures included that are a huge draw for the Five Rathas. It is dedicated to the God of Rain, Lord Indra. The Bhima Rath is huge. 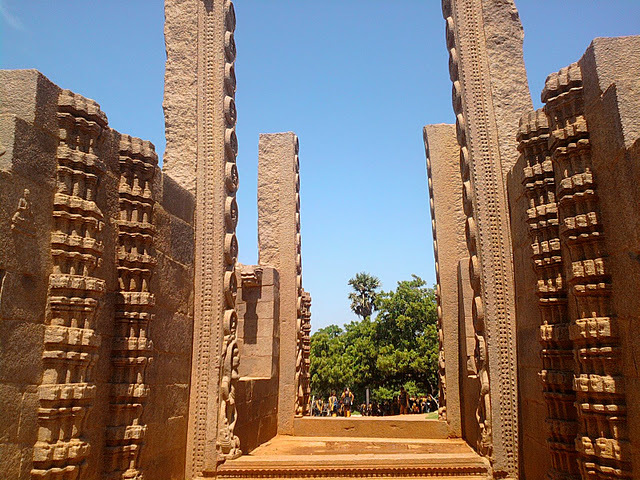 The pillars there do contain lion carvings even though the ratha as a whole is incomplete. The largest of the Five Rathas is the Dharamraja Yudhistar's Rath. This rath is also dedicated to Lord Shiva and is a great example of later built South India temples. Arjuna's Penance, the world's largest bas-relief measuring 27m x 9m is the pride of Mamallapuram. This huge whale-back shaped rock contains figures of gods, demigods, men, beasts, and birds and in fact, can be said to represent creation itself. This beautiful work symbolizes either "Arjuna's Penance" or "the Descent of the Ganges", or possibly both. Arjuna's Penance: According to the story in the epic Mahabharata, Arjuna, one of the Pandava brothers, offers prayers in extreme conditions in order to obtain Lord Shiva's weapon. Descent of the Ganges: According to this story, the sage Bhagiratha, offeres prayers in extreme conditions in order to bring the river Ganges down to earth. On the relief one can can see many scenes being carved out in support of both the stories. The left side has the main elements of the story. Just above the shrine, Arjuna (or Bhagiratha) stands on one leg, his arms upraised, in a yogic posture. While the right side has scenes of the natural and celestial worlds and the life-sized elephants protect their young. A natural cleft populated by nagas (snakes) separates the two halves of the relief. 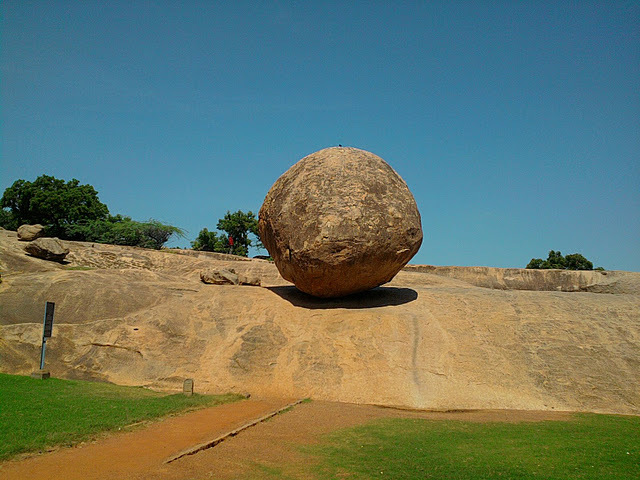 Krishna's Butter Ball , is a huge boulder near the Ganesha Ratha is popularly known as Krishna's butterball. It rests precariously on a narrow rock base and seems to defy the rules of gravity. It is fifteen feet in diameter and could have probably been the raw material for the temples around. It is believed that several Pallava kings have attempted to move the stone, but legend is that neither the kings nor their elephants could shift the boulder even by an inch. Krishna Mandapam: This is the biggest among the Mandapams and is dedicated to Lord Krishna. Lord Krishna is a famous legend who has been the figure of many mythological stories. The sculptures inside this Mandapam beautifully picturize the myth of Lord Krishna during his brave and energetic adulthood. Varaha Cave Temple: This is a fine completed architecture which lies besides the Arjuna penance. The entrance has two pillars engraved with two horned lion – bases, and a cell protected by two gate keepers. 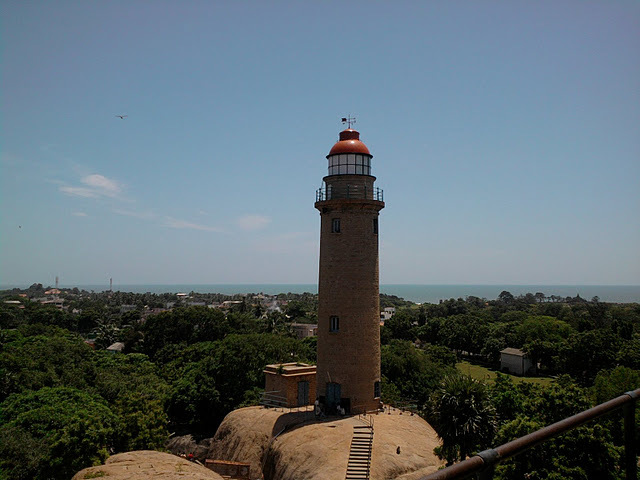 Also Mahabalipuram is famous for the beautiful beaches and beach resorts. The beach besides the shore temple, is very well maintained compared to many beaches in Chennai. 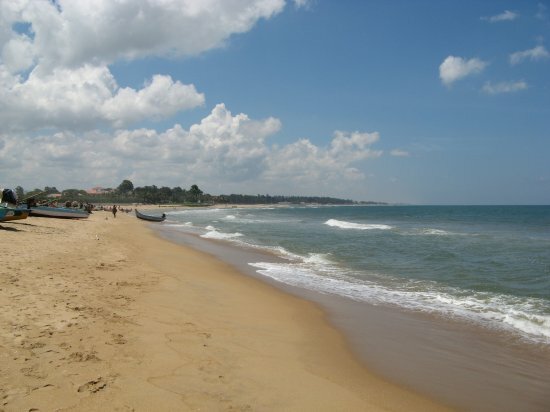 Apart from that beach, there are many public and private beaches in the outskirts of Mahabalipuram. There are many resorts in around Mahabalipuram, most popular among them were GRT Temple Bay resort, mamalla resort, Silver sands, TTDC Beach Resort and many more. Chennai MTC is running Volvo AC buses and also ordinary buses from T-nagar, CMBT, Chennai Central to Mahabalipuram directly. Traveling in Volvo is the best option to reach Mahabalipuram. If you stay in OMR, then the best way is to board bus at Thiruvanmiyur Bus Stand. Almost every bus that goes through ECR will have a stop at Mahabalipuram. Visit http://www.mtcbus.org/ for MTC bus timings. Cabs can be taken from the city of Chennai to Mahabalipuram and charges will range around Rs 1000 to 2000. A combined entrance ticket to the Shore Temple and the Five Rathas costs Rs 250 for foreigners and Rs.10 for Indian citizens. Local guides, who speak multiple languages, are available for around Rs 200 for a tour of all main attractions. You can also hire a cab or auto for about Rs.150 for 2 1/2 hours, during which you will be taken to all the major tourists spots in Mamallapuram.